Shadowgraphy, also called "OMBROMANIE", or the art of creating shadow figures with your hands is as old as mankind. The first to take this technique to another level was an Italian painter named Campi. According to Mahatma Magazine, he created many new forms and figures. Another fellow named Frizze from Belguim quickly copied Campi. Along the way, 19th Century French artist Felicien Trewey (b. May 23, 1848 - d. December 2,1920) to inspiration from Campi and Frizze and made shadows popular in the theatre. Trewey was a remarkable individual who was adept in many skills such as magic, balancing acts, juggling, chapeaugraphy, music and more. 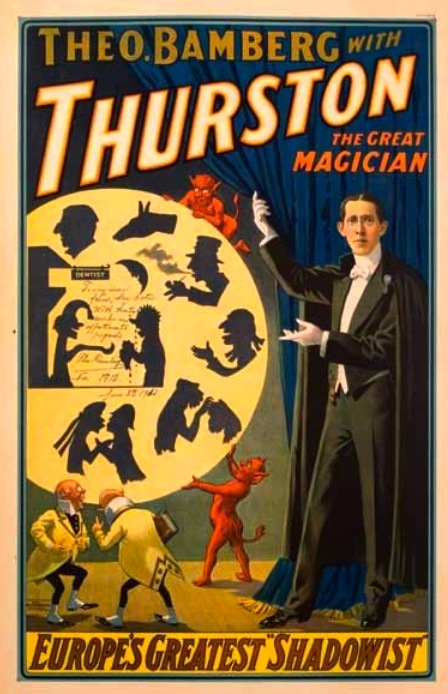 He developed an act where he would create one hand shadow after another. Not only would he create shadows of animals but many of those shadows were highly animated. He also created hand shadows of people. He continued to take the art forward by adding props and creating shadow playlets. Eventually, Trewey put out a book, The Art of Shadowgraphy: How It Is Done, which showed some basic hand shadows as well as some of the more complicated figures of people and even some of the prop shadows. 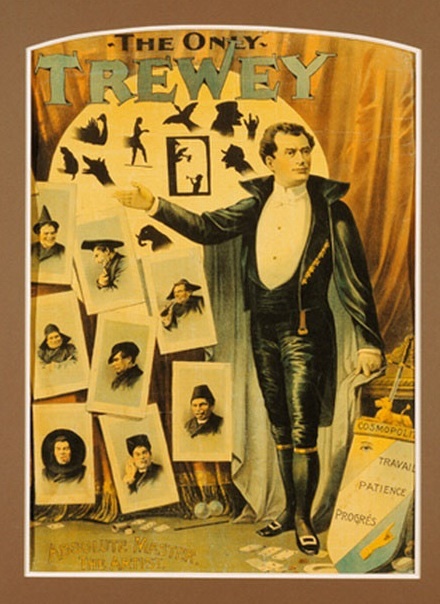 Trewey came to America as part of Alexander Herrmann's troupe and toured with 'Herrmann's Transatlantic Vaudevilles'. the wall had always been something that people did at home for amusement. But Trewey proved it could be more. Soon there were many others doing shadow acts. One of the others who helped popularize the hand shadow act was Theo Bamberg (1875-1963), also known as OKITO. 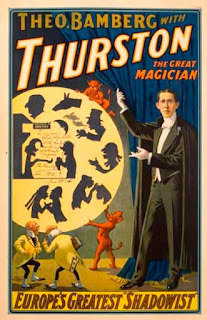 Theo came from a long line of magicians. His father and his grandfather and his great grandfather were all magicians. Theo developed the hand shadow act in his teens, quite a few years before he became known as OKITO. Eventually Theo Bamberg would pass his shadow act on to his son David. Young David's stage name was FuManchu and I think it's due to FuManchu that the art of hand shadows still lives on today. David Bamberg taught a number of students the techniques of hand shadows and eventually one of those students, Carlos Greco from Argentina, began to teach others. And thanks to Carlos Greco, I too am learning Shadowgraphy. A few years ago, Creco and Bazar Di Magia of Argentina put out 2 DVDs on the techniques of Hand Shadows. I was fortunate enough to see Greco present the Hand Shadows live and in person. But the DVDs are extremely helpful as a teaching tool. I am creating an act similar to the one presented by Edward Maro at the turn of the century. Maro presented magic, lightning fast paintings, played music, and included shadows in his show as well. I will debut my Shadow Act on September 19th in LeLand Michigan at the W.T. Best Theatre. I should mention, that I have had Shadowgraphy in my show in the past. Back in 2004 I had my chief assistant Denise learn the shadows and she presented an excellent routine in the middle of the show. It was always very well received and one of my personal favorite moments from the show. But for those who are interested in seeing a shadow act, below is Fu Manchu and a few minutes of his wonderful shadow figures.